WHY ARE GOGGLE LENSES COLOURED? How you see the water through your goggles depends on the colour of the lens you choose and the environment you are swimming in. For example, if you are swimming outdoors in a sunny environment you would select goggles that have a Mirrored or Dark colour lens to reduce brightness and glare. Brighter vision that are best for indoor swimming or overcast days. Best suited to outdoor swimming, reduces brightness and glare. Same absorption properties as human eyes and do not tire the eye. Distances can be seen sharply, contrast enhanced, absorbs light from the blue and purple short wave lengths group. Super contrasting lens colour that provides a great filter against blue light. Also provides great depth perception and shadow definition, making this lens ideal for indoor use or overcast conditions. All colour wavelengths are absorbed equally. This allows for colour tones to be seen naturally making the smoke lens ideal for outdoor use. Designed for low light and overcast conditions where maximum visibility is necessary. Provides accurate vision without filtering out colour. WHAT IS THE DIFFERENCE BETWEEN GOGGLE STRAPS? Allows goggles to wrap around swimmers heads securely for perfect fit. Allows goggles to be applied quickly and easily. Allows goggles to be placed in different places on back of head to ensure a secure and perfect fit. WHAT ARE MY GOGGLES MADE OF? A high performance plastic, with an outstanding resistance to impact which can be produced as a transparent material making it perfect for goggle lenses. A synthetic alternative to rubber, TPR contains no natural rubber (latex). Used in a large range of goggles. Similar to TPR in a lot of ways, TPE can be suited to bonding plastic together depending on its chemical construction. A flexible, elastic material that has a good wear resistance. A universal material used in a lot of products including swimwear products. Available in high density (HDPE) and low density (LDPE). Both versions show great chemical resistance to water absorption. HDPE can be processed to be flexible, LDPE is more rigid and has a lower level of water absorption in comparison to HDPE. One of the first available plastics globally, still used in everyday products. Comes in rigid or flexible material and is available in a range of colours. Tough and flexible, the chemical properties in this plastic mean that it can be engineered to bond with a number of other plastic types. Available in various forms including general purpose (GPPS) and expanded (EPS). GPPS is most commonly used in compact disc cases and can be low cost, rigid and brittle. EPS is created by adding air into the polystyrene. Sharing many of its properties with rubber, EVA is often used in shoe soles due to its flexibility and high friction coefficient. Good for products that need a high gloss finish. A high quality plastic which is tough and rigid. Used as the base material for many goggle seals and straps. This variant of silicone is a solid block of material in its base form. It is then processed using pressure and heat to give an end product which is soft, flexible and has good elasticity. Silicone is used widely as it is a good material for people with sensitive skin. The best material for cutting edge goggles, Liquid Silicone is high grade, has a super soft feeling against the skin, and is hypo allergenic, meaning the chances of irritation are minimal. It offers superior comfort, is tear resistant and moulds to your face. Liquid silicone also has a flex fatigue resistance 8-20 times stronger than conventional products and is extremely resistant against wind, rain and UV rays. Misting or fogging on the lens of a swimming goggle is caused by the difference in temperature between the cold of the water and the warm skin of the swimmer. This temperature difference causes a thin film of water vapour to build up on the inside surface of the lens which in turn restricts visibility. To stop this occurring, manufacturers apply either a formula solution or polymer (chemical compound) to the inner surface of the goggle lens. The formula's used aim to either repel the water vapour or use the condensation to create a thin layer of uniform water over the lens. WHAT DOES UV PROTECTION MEAN? Ultraviolet rays, commonly known as UV rays, are widely recognised as the most harmful of the sun's rays. To prevent damage from the sun, many companies now offer protection against harmful UV rays in goggle ranges. If you are looking for a pair that have UV protection, be sure to check the features and specifications of each pair you are interested in to ensure you are protected. WHAT DO YOU MEAN BY LIGHT TRANSMISSION? A measurement of how much of the light which hits the lens is allowed to pass through it and in to the eye. Generally, the darker the lens the lower the level of light transmission. As an example, on a bright day it would be advisable to wear goggles that have a smoke coloured lens to reduce brightness. 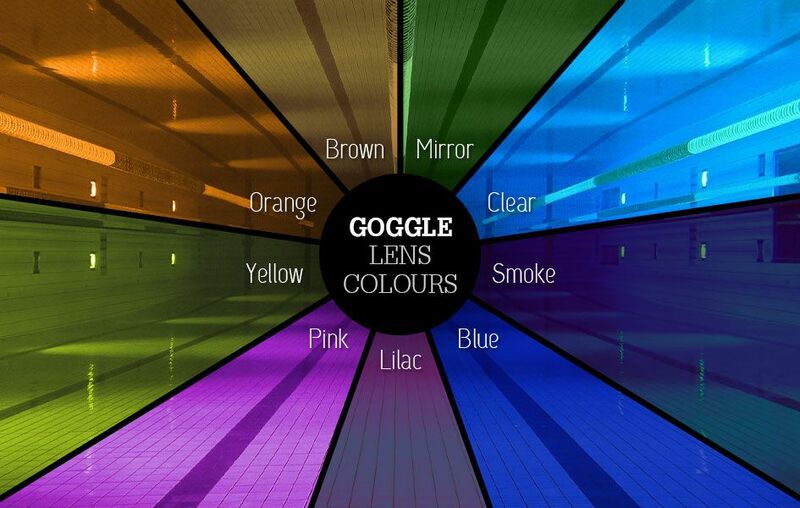 On an overcast day or when swimming indoors choose a yellow or amber lens colour to let a little more light in.